This Holiday Caravan is 35 feet long and 12 feet wide. 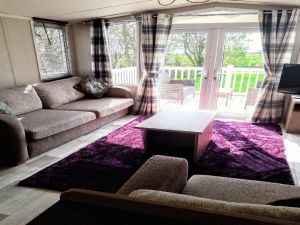 Our lovely Prestige graded holiday home is for let on Berwick holiday park. The caravan has two bedrooms and a sofa bed in the lounge it can sleep up to six people,it has a large lounge and kitchen area with a free standing dining table and chairs,in the kitchen there is a gas cooker with oven and grill,full size fridge freezer,and microwave. In the lounge there is a three and two seater sofa a 40" television. There is a double bedroom with a large wardrobe and an en suite toilet. The twin room has wardrobe space. We have a large outside decking area with patio furniture which overlooks the golf course. Linen is provided and beds will be made up for your arrival. The beach is a five minute stroll from the caravan and the town of Berwick upon Tweed is a short walk away, the main complex is also a short walk from the caravan. £70 per night high and low season. Bookings welcomed for Monday to Friday, Monday to Monday, Friday to Friday or Friday to Monday. This caravan listing does not have an online availability calendar. Please contact the caravan owner directly using the contact details below. £70 per night low and high season. minimum let 3 nights. These rates are a guide only - contact the caravan owner with your required travel dates for a confirmed costing and details on how to make a booking. This caravan rental does not have any special offers or late deals available at this time. If you are interested in renting this caravan please contact the owner directly either by e-mail or telephone. We do not have any involvement in caravan bookings, our role is simply to put people looking to book a private static caravan in touch with owners of holiday caravans. This listing for a privately owned static caravan rental has been viewed 356 times.